After decades of laboratory investigations mechanical circulatory support for the failing heart has entered the clinical arena. Today, a growing number of patients with progressive myocardial failure awaiting cardiac transplantation is successfully bridged to transplantation with ventricular assist devices. 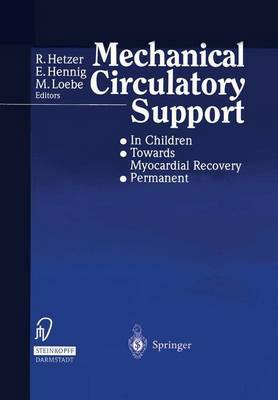 The proceedings of the "Mechanical Circulatory Support"-meeting, held in Berlin, October 21-22, 1995, present new aspects of mechanical circulatory support, recent experience with MCS in newborns and children using specially developed small devices, and the results of long-term mechanical assistance. The ability of the myocardium to recover under pressure de-loading and reduced workload is discussed. All these topics open up new perspectives for the use of mechanical circulatory support, not only as a bridge to transplantation, but also as a definitive approach for treating patients with end-stage heart failure. Some of these concepts may even provide real alternatives to heart transplantation, these being sorely needed in light of the severe donor organ shortage. Regulatory as well as ethical aspects of the extended use of mechanical circulatory support systems and new technical developments in the field are discussed by internationally distinguished experts.